FTC Compliant casting and tracking by Kamen Entertainment Group, Inc.
Marina is a mother of 3 who has lost 100 pounds! She knows what it takes to lose weight! A pioneer in the fitness community for over 30 years, Marina was one of the original aerobic instructors at Body Design By Gilda (NYC) back in 1980. Marina works with the utmost sensitivity needed to achieve the best results with the lowest dropout rates. Marina has been at the forefront of infomercial testimonial casting for over 20 years and has worked with the most pregistous Advertising Agencies in the world in addition to DRTV heavyweights QVC-QDirect, Hawthorne Direct, Sylmark, Gaiam, Allstar Products Group,Tristar Products, Strive, Urban Group Exercise and Script to Screen. Located in the heart of NYC, Marina has access to the World’s best talent pool for casting fitness infomercial testimonials. 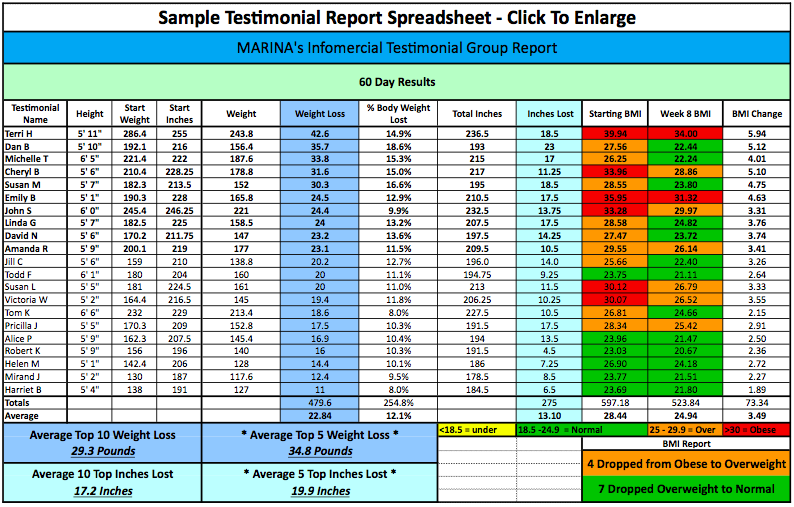 If your product is fitness and/or weight loss related, Marina makes it easy to track your weight loss candidate’s progress and keep them on target. Marina’s “hands on” approach, together with her staff of certified trainers, are sure to get you the results you need for your fitness and weight loss infomercial clients. Marina’s Testimonial Group staff will work closely with you to educate your testimonial candidates in the correct way in which to use your particular product. Marina hand picks your testimonial candidates from the largest talent pool on the East Coast through casting calls, newspaper ads, flyer distribution at health clubs, health food stores, shopping malls, gyms and schools. Instant testimonials may be videotaped on a sound stage or on location at Shopping Malls… Grocery Stores… Schools or any other location that you and your show may require. If your product is fitness and/or weight loss related, training and tracking typically takes between 4 to 12 weeks depending on the product and it’s particular claims, however, shorter or longer periods can be requested. Fitness and weight loss testimonial candidates are weighed and measured weekly, photographed or videoed and questioned, depending on what your needs are. We will obtain releases for liability, legal, model, and use of name as needed as well as affidavits. Candidates will receive personal as well as group trainings up to 10 times per week. Infomercial testimonials will be contacted daily by phone and or email 24/7 by Marina to motivate them to stay on track and handle any concerns they may have. This entry was posted in Casting, Direct Response, DRTV, Fitness Infomercial Casting, Fitness Program, Infomercial, Infomercial Testimonial Casting, Talent, Testimonial Management, Uncategorized, Weight Loss Program by admin. Bookmark the permalink.